As if watching Crosby, Malkin and $45 million of new defensemen wasn't enough, the Pittsburgh Penguins are going to have giveaway nights galore this coming season. * Youth promotional items given to fans age 14 and under in attendance. FYI - the first home game (10/7/10) will be commemorated with a special replica ticket as shown above. 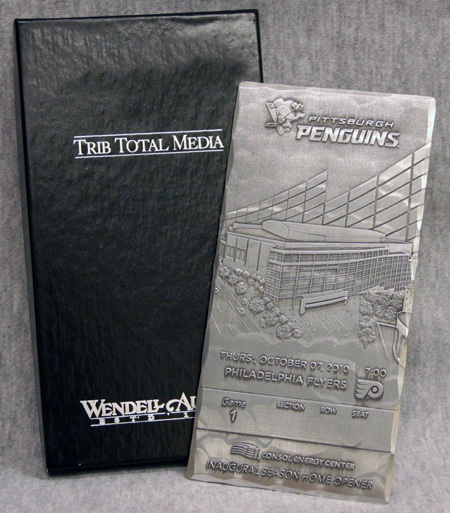 A similar ticket given out by the Pens for the last game at the arena is going for anywhere from $50-$70 on eBay, with the team-exclusive bronze edition tickets selling in the $175 range. Haha, does that come with a certificate of authenicity? ...Or a certificate of relevence to this post?